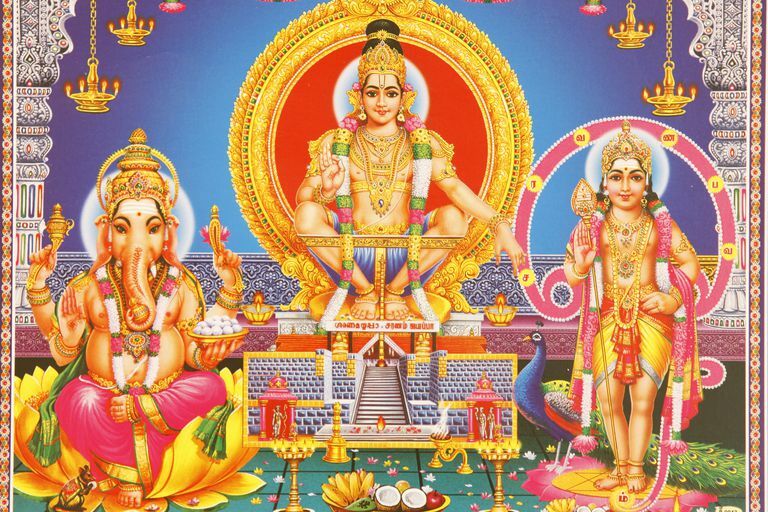 Lord Ayyappan, or simply Ayyappa (also spelled as Ayappa), is a Hindu deity worshiped mainly in South India. Ayyaappa is believed to have been born out of the union between Lord Shiva and the mythical enchantress Mohini, who is regarded as an avatar of Lord Vishnu. 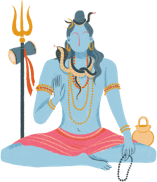 Therefore, Ayyappa is also known as "Hariharan Puthiran" or "Hariharputhra," which literally means the son of both "Hari," or Vishnu, and "Haran," or Shiva. Ayyappa is also commonly known as "Manikandan" because, according to the legend of his birth, his divine parents tied a golden bell (mani) around his neck (kandan) soon after his birth. As the legend goes, when Shiva and Mohini abandoned the baby on the banks of the Pampa river, King Rajashekhara, the childless monarch of Pandalam, found the newborn Ayyappa, accepted him as a divine gift, and adopted him as his own son. The legendary story of the genesis of Lord Ayyappa in the Puranas, or ancient scriptures, is intriguing. After Goddess Durga killed the demon king Mahishasur, his sister, Mahishi, set out to avenge her brother. She carried Lord Brahma's boon that only the child born of Lord Vishnu and Lord Shiva could slay her, or, in other words, she was indestructible. To save the world from annihilation, Lord Vishnu, incarnated as Mohini, wed Lord Shiva, and out of their union Lord Ayyappa was born. After King Rajashekhara adopted Ayyappa, his own biological son, Raja Rajan, was born. Both the boys grew up in a princely manner. Ayyappa, or Manikandan, was intelligent and excelled in martial arts and the knowledge of various shastras, or scriptures. He surprised everyone with his superhuman powers. Upon completing his princely training and studies when he offered gurudakshina, or a fee to his guru, the master, aware of his divine power, asked him for a blessing of sight and speech for his blind and dumb son. Manikantan placed his hand on the boy, and the miracle happened. When it was time to name the heir to the throne, King Rajashekhara wanted Ayyappa, or Manikantan, but the queen wanted her own son to be the king. She plotted with the diwan, or minister, and her physician to kill Manikandan. Feigning illness, the queen made her physician ask for an impossible remedy—lactating tigress' milk. When no one could procure it, Manikandan volunteered to go, much against his father's will. On the way, he chanced upon the demon Mahishi and slew her on the banks of the river Azhutha. Manikandan then entered the forest for tigress milk, where he met Lord Shiva. At his behest he sat on the tiger, who was Lord Indra taking the form of a tiger. He rode back to the palace on the tiger and others followed in the form of tigers and tigresses. Those people who'd ridiculed him for taking the journey ran away at his approach with the wild animals. Then his true identity was revealed to his father. The king had already understood the queen's machinations against his son and begged Manikandan's forgiveness. The king said that they would build a temple so that his memory could be perpetuated on earth. Manikandan chose the location by shooting off an arrow. Then he disappeared, leaving for his heavenly abode. When the construction was complete, Lord Parasuram sculpted the figure of Lord Ayyappa and installed it on the day of Makar Sankranti. Thus, Lord Ayyappa was deified. Lord Ayyappa is believed to have laid down strict religious adherence to receive his blessings. First, the devotees should observe a 41-day penance before visiting him in the temple. They should maintain abstinence from physical pleasures and family ties and live like a celibate, or brahmachari. They should also continuously contemplate on the goodness of life. Moreover, the devotees have to bathe in the holy river Pampa, adorn themselves with three-eyed coconut (representing Shiva) and aantha garland, and then brave the steep climb of the 18 stairs to the Sabarimala temple. Sabarimala in Kerala is the most famous Ayyappa shrine, visited by more than 50 million devotees every year, making it one of the most popular pilgrimages in the world. Pilgrims from around the country brave the dense forests, steep hills, and inclement weather to seek the blessings of Ayyappa on January 14, known as Makar Sankranti, or Pongal, when the Lord himself is said to descend in the form of light. The devotees then accept prasada, or the Lord's food offerings, and descend the 18 steps, walking backward with their faces turned toward the Lord.